As your roof ages it will become more prone to damage from severe weather and required repairs will become much more expensive with each year that passes. Please consult the following list of tips and suggestions to help prolong the life of your roof and minimize the roofing repairs that you need. Prevention is Better than Cure: Look for potential problems on a regular basis. Look for missing or cracked tiles, damp areas on the ceiling, and more to prevent further damage. Clean the Gutters: The overflow of gutters not only causes damage to your home's siding, but also goes upward when leaves pile too high in gutters, causing damage to roof sheathing, roof rafters, and the lower deck board. Remove Debris from the Roof: Debris such as tree branches, moss growth, and last year's Frisbee will collect moisture and cause damage. Invest in the specialized roof services of a trusted local roofing company. Roof Cleaning: It is important to rid your roof of growths such as moss, algae, and fungus lichens. These can damage your roof and the sheathing beneath. Regular Inspections: No one expects a homeowner to also be a roof specialist. This is why expert roofing services like us are here – to help you. It is important to have your roof professionally inspected at least once a year. Watch the Eaves: The eaves will tell you a lot about the roof's condition and are usually one of the first places to show signs of problems. Trim Overhanging Trees: Trim any branches that hang over your home, as this will help keep leaves, moss, and rodents off your roof. Inspect the Attic: Ensure the attic insulation is properly installed; warm air leaking through will cause shingles to decay quicker and the rafters to warp. Insulation & Ventilation: A healthy roof requires adequate ventilation and insulation for proper climate control. Ask us to assist you with proper materials that will help reflect heat and prolong your roof's life. 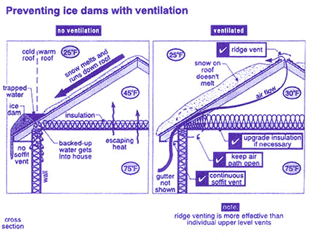 Proper ventilation reduces condensation in winter and heat in summer. It also prevents attic insulation from deteriorating. You need sufficient roof vents and soffit venting to properly ventilate your attic. Check for Signs of Missing Shingles: If you have noticed any pieces of shingles in your yard or areas where shingles are missing on your roof, or if you have cracked or curling shingles, it is important to have your roof inspected by a professional roofing contractor before the problem becomes worse and more expensive. If ice and snow removal is needed, be sure to hire a professional roofer.